One of the most interesting segments of the digital camera market is in “adventure sports” cameras, which are designed to capture still and video images of primarily outdoor activities such as diving and hiking. These cameras are designed to withstand abuse and are often waterproof, dustproof and shockproof. While everyone is familiar with the very popular GoPro series of cameras, several of the major camera manufacturers have introduced traditional “point and shoot” cameras that are designed to withstand the abuse that outdoor cameras often are exposed to. One of the most affordable of these cameras is the Ricoh WG-20, which was introduced in 2014 and claims to be “adventure proof”! Despite its age, it remains a very popular camera for Ricoh, despite upgraded models of this camera being on the market as well. What really sets the Ricoh WG-20 apart from the other compact cameras in its class is the fact that it features a polycarbonate plastic body that is waterproof to depths of 33’, making the WG-20 excellent for snorkeling or shallow diving. 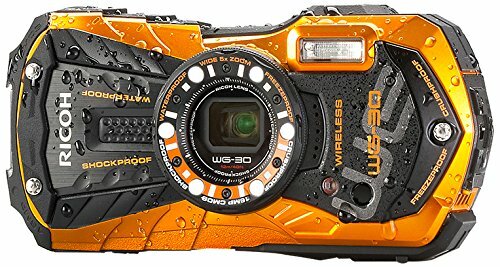 In addition, the WG-20 is dustproof, as well as shockproof and crushproof, making the WG-20 perfect for many outdoor activities where the camera could be subject to abuse and rough conditions. However, to achieve this, Ricoh was forced to compromise on a number of the camera’s specifications to be able to offer the WG-20 at a suggested retail price of $199.95. Check out the latest prices here! That being said, Ricoh did not down spec the cameras in areas that would impact image quality, beginning with the camera’s CCD sensor, which is based on the 1/2.3 format. The sensor measures 6.17mm x 4.55 mm and is actually larger than the sensors found n many other “point and shoot” cameras and captures images at 14.48 megapixels, with the image quality being generally very good, which is the most important performance feature of any camera. Another area where Ricoh did not compromise in is the lens used by the WG-20, which features a 5X optical zoom and a 6.7X digital zoom. This performance is achieved by a Pentax f3.5 – 5.5, 5-25mm, which is the 35mm equivalent to a 28-135 lens. The lens covers the range between a wide angle and moderate zoom lens and performs well in a wide variety of lighting situations. Unlike other compact cameras, the lens of WG-20 does not telescope out beyond the face of the body, which makes a big difference in protecting the lens. Most photographers have at least one compact camera where the lens has jammed while extended! Like most compact cameras, the WG-20 does not have a viewfinder. Instead, images are composed holding the camera away from the photographer’s face and composing the image using the camera’s 2.7” fixed rear LCD screen. In addition to being used to compose images, the LCD screen, which tends to be a bit hard to read in bright sunlight, is used to navigate the camera’s menu system. The menu system is fairly easy to navigate without referring to the owner’s manual. When composing the image, the photographer will find up to 9 autofocus points, which are evenly distributed on the LCD screen and fairly easy to select. While having this many autofocus points is nice, most will elect to use the center one and will more than likely not use the others. While the autofocus points were fairly quick to lock and hold focus, it is important to keep in mind that this is still a compact camera and is not designed for sports and fast paced action photography. Often people will blame cameras for poor performance in certain situations, but the photographer needs to keep in mind what the particular camera is designed for managing their expectations accordingly! As far as the specification compromises mentioned earlier, the first compromise that you will encounter with the WG-20 is that the camera does not have the normal program, aperture priority, shutter priority and manual exposure settings. Instead, Ricoh limited the WG-20 to a “programmed auto” exposure mode only, which makes the camera a true “point and shoot” camera. It does, however, limit the photographer’s ability to take more control over the camera, which some may find a negative feature, while others may find a positive trait! However, Ricoh did incorporate a number of the preset scene and creative exposure modes including macro, digital microscope, underwater, night scene and digital panorama. Many will find these various modes useful and fun to use. Other areas where compromises were made include the speed of the camera, as measured in frames per second. In the case of the WG-20 it is capable of only shooting at .67 frames per second in the normal continuous shooting mode. This rate can be maintained for up to 24 frames before the camera runs out of buffer as the processor bogs down processing the images. However, the camera is capable of shooting at higher rates in the high continuous shooting mode with certain limitations. As far as the native ISO range of the camera, the WG-20 is pretty typical of most compact cameras having a range of 80 – 6,400, with no ability to expand the ISO range up or down. Image quality is best at lower ISO settings, with image quality really suffering when the ISO is pushed over 800. While the camera does have a built in flash, it is best to use the WG-20 in decent light conditions. Again it is important to manage expectations, as this is a lower end compact camera and not a DSLR. As with most cameras in this class, the Ricoh WG-20 features a single memory card slot, which holds a single SD, SDHC or SDXC memory card. Images are stored as JPEG files, with the WG-20 being unable to capture images in RAW format. The camera also has built in internal memory with a capacity of 97 MB. The memory card and battery, which is rated to 260 still images per charge, are located in the same bay at the bottom of the camera. While the WG-20 is capable of shooting video, it is in standard definition, with a resolution of 1,280 x 720, as well as other formats. Depending on the format, the frame rate varies from 15-30 frames per second, with the video being stored as AVI files. Overall the video quality is acceptable and the ability to shoot video underwater is a great feature of the WG-20. Other features of the WG-20 include a shutter speed range of 1/5,000 to 4 seconds, which is an odd range and is not seen often. The camera measures 4.49” x 2.28” x 1.1” and weighs in at 5.78 ounces, making it compact and light enough to carry anywhere. One surprise with the WG-20 is the lack or GPS and Wi-Fi capabilities, which are pretty common features on most compact cameras today. While most serious photographers look at image quality over technical specifications, many feel that the specifications are equally important. The Ricoh WG-20 has excellent image quality, as well as technical specifications, which are shown in the table below. Check out the latest pricing here. * Information from Ricoh website, including pricing. The Ricoh WG-20 is a really fun camera at a great price. Consumers that would enjoy this camera are just not people that enjoy adventure activities outdoors, but people that are looking for a bulletproof camera to take on vacation or a trip to the beach. Capable of taking decent pictures without breaking the bank, the Ricoh WG-20 is equally at home on vacation in Bermuda or with your kids in the community pool. Anyone looking for a low price compact camera with some high-end features should look at the Ricoh WG-20. The Canon PowerShot SX530 HS: Is This the Camera for You? 360 Fly vs GoPro (2019 Comparison): The Battle Of The Action Cams!